A little while ago there was a short interview published with Professor in geophysics, Páll Einarsson. In the interview it seemed like he was stating that Bárdarbunga, Grimsvötn, Hekla and Katla all were preparing to erupt shortly. So, once more it is time to take a look at the instrumental evidence at hand and write about the probable eruptive timelines in a slightly more understandable way for the lay audience compared to the sweeping broad geological sense, or the hysterical short time span of journalists. Or in other words, let us put a human timeframe on geological timescales in alphabetical order. Map of Volcanic features in Iceland by Gaz Dale. The original is gargantuan, however, this is just a preview… Additional information from FutureVolc and base map terrain render from Google Maps. Volcanocafé has so far mainly been a popular science magazine where the readers can interact and discuss all things volcanic (and quite a few other things). This will always be the case, but things need to evolve to not become stale. Lately the technical wizards behind the scene have been doing really weird things with the intent of making the place far more interactive. I will not state what the end of it will be since I barely understand it. So it is up to them to make the announcements when they are ready. Let us just state that there will be things and tools coming that will be really useful during the upcoming year, especially for those who are friends of Icelandic volcanism. And before I start I would like to thank Andrej Flis (DownUnder) for the wonderful 3D-videos of earthquakes that is the graphical backdrop for this article. Look through them and while doing so I urge you to think about the volcanoes as the upside-down entities they are, the interesting things are happening at the top (and the top of a volcano is at the bottom of the crust or even deeper). Nobody has missed that Bárðarbunga is intensely seismically active and that it has been like that since prior to the onset of eruption. Problem is just that people are not grasping that the causation of the earthquakes has changed dramatically as time has passed. During the time prior to the eruption and during the first couple of weeks the earthquakes were caused by magma intruding into bedrock and the magma reservoirs. After that the main number of earthquakes was caused by magma very rapidly leaving the magma reservoir. In fact, magma moved out so rapidly that it left the poor main magma reservoir under-pressured, a state that remained until late summer 2016. The effect of this was that the entire caldera floor moved downwards into the magma reservoir. Somewhere in October the pressure had increased enough from magma moving up from depth and the dropping caldera plug that the dropping stopped. The pressure was still far from the level prior to the eruption, but after that the earthquakes are caused by pressure increases from intruding magma. This was further evidenced by the non-volumetric change non-double-couple M4.9 earthquake that occurred at 1.47pm on the 30th of January. These earthquakes are rare birds indeed and are almost all exclusive to Bárðarbunga. They occur as slightly cooler magma in the upper magma chamber rapidly changes place with warmer magma at the lower magma reservoir. Therefore there is no change in volume in the volcano even though magma moves rapidly up (and down). These large earthquakes happen about once a decade at Bárðarbunga and they do increase the amount of energy in the volcano and they are as such heralds of activity to come. But it is also good to remember that the last large one (+M5) was in 1996 and the subsequent eruption occurred in 2014, so they are not a sign of an impending eruption as such at Bárðarbunga. In other words, if anything happens in the next few years it will most likely be a small eruption, but even that is not likely in the next couple of years regardless of the intense seismic activity. The Grímsvötn eruption of 2011 was the largest eruption in Iceland since the 1783 eruption of Lakí. The amount of lava that formed ash and tephra was in the 0.9km3 (DRE) range and it also emplaced close to 1km3 of lava on the bottom of the caldera. As such it should be counted as a VEI-5 eruption, but the happy Icelanders are adamant that if it is not a cubic kilometer Dense Rock Equivalent of ash it is not a VEI-5, the rest of the planet uses 1km3 of ash and tephra that is not recalculated into Dense Rock Equivalent as the point of decision. Be that as it may, it was the largest eruption on the planet since the October 1991 eruption of Mount Hudson in Chile. The effect of this large eruption from Grímsvötn is that it lost a lot of magma in the responsible magma reservoir. In a way, this is the same thing that happened at Bárðarbunga in 2014, it will take a longer time for Grímsvötn to recuperate since the magma influx into Grímsvötn is unusually steady for a volcanic system. Problem is just that the volcano has 3 separate magma reservoirs, so just because one is low pressured does not automatically mean that the other two are low pressured. The eastern magma reservoir is almost entirely inactive and is believed to be containing stale cooling magma and is as such unlikely to erupt unless it receives a large dollop of fresh magma. The Northwest magma reservoir had a large eruption during the 1996 Gjálp event and is still recuperating after that. The last eruption was at a central-south magma reservoir and that one will need several years to build up in pressure and magma. The problem here is that there is a fourth magma reservoir. I know that I just wrote that there are 3 reservoirs in Grímsvötn, and the answer to that conundrum is that the fourth chamber is located under what is believed to be a separate central volcano named Háabunga SSW of Grímsvötn proper. The main bulk of the seismic activity has been in, around and at fissures emanating radially from this volcano after the 2011 eruption of Grímsvötn. Normally it is very easy to predict when Grímsvötn will erupt, you just measure the increase in pressure as evidenced by cumulative seismic moment plots. As magma moves in the pressure increases and earthquakes will occur as rocks fracture around the magma chamber. Problem is just that this is a very useful tool for the two known active reservoirs of Grímsvötn that we have good records of. We are not entirely sure if this is also true for a behaviorally unknown volcano such as under Háabunga. For all we know it could have had several intrusions over the last 100 years or so and be primed to erupt, it could also require several more intrusions. We do though know one thing, and that is that it is an open conduit system as evidenced by the silent intrusion that occurred a couple of months ago. Normally this would have caused a large earthquake swarm around the magma reservoir, but since this did not happen I suspect that the pressure is still fairly low in this volcanic system and that it will take time before it will be able to erupt. If it will be Háabunga that erupt, it will take anything between 6 months up to 100 years before it erupts. And when it happens we will not know the characteristics of the eruption. I am though quite convinced that we will see a lot of seismic activity in the weeks prior to an eruption. The other option is that we will see a regular Grímsvötn eruption, and if that is the case we must wait anything from 6 months to 3 years depending on the level of seismic activity that will be indicating the regular pressure increase. We know from GPS records that Hekla had recuperated back to the same level as prior to the 2000 eruption back in 2011. This lead to a false runup to eruption in 2013 that had the Icelandic Met Office issue an alert. I was also convinced that it would erupt then, but Hekla fooled us all back then. I have lately been toying with the idea that you can predict a Hekla eruption with the same type of predictive tool as I use for Grímsvötn, or in other words Cumulative Seismic Moment plotting. The only thing is that there is no public available record spanning decades as it is for Grímsvötn. There may be such records at the Icelandic Met Office, but even those records would be intensely skewed by the increase of sensitivity in the system due to technical development and increase in the number of seismometers around Hekla. But, the partial record that we all can see is giving off a couple of clues. If the idea to use CSM as a predictive tool is true there should over time be an increase in the amount of released strain in the form of earthquakes that is logarithmic. And if we look at the plot there seems to be evidence of that, but it is not statistically proven in any way. To go from my theory to get a useful statistical predictive tool we would need at least two complete cycles of eruptions (preferably more). At Grimsvötn we have 4 recorded cycles (1996, 1998, 2004 and 2011) that shows the same pattern. Giving a time frame for Hekla is therefore very hard to give. We do know that the pressure is high, we do know it almost caused an eruption in 2013 and after that the rate of earthquakes has increased at what looks like a logarithmic scale. As such we do know that it is very close to erupting, but due to the lack of long-term records we can’t give a definite answer of when it will occur. We know that the runup at the volcano is very short, so Hekla could erupt at any time from 30 minutes to 10 years into the future. Currently I hold Hekla as the most likely Icelandic volcano to erupt in 2017, but that the caveat from up above still stands. As we get to Katla things rapidly become very muddy since it is the only volcano out of the four that we have no instrumental record for prior to, during runup and during an eruption. Even the written accounts from previous eruptions are unusually unclear for being from Iceland. That being said, we do have a very good instrumental record from 1990 and onwards, and it just become more excellent as the years pass by. One thing we could do is to compare Katla to other large caldera volcanoes that has erupted in instrumented times, namely Bárdarbunga and Grímsvötn. The problem there is that the pattern emerging does not comply to what these two volcanoes are doing during their respective volcanic cycles. So, we are not getting any help at all there. In the end, we must go back to the fundamental physics of a volcano near a mantleplume and take it from there and compare that to the instrumented records that we do have and make educated guesses. Magma is formed at the bottom of the crust and moves up into a volcano like Katla and we know this has happened several times since 1990, last time it happened was in 2011. Now some of you will be pointing out that we are now seeing larger earthquakes than has ever been recorded at Katla and that must mean that magma is moving up. Problem is just that when magma is moving upwards in Katla the earthquakes start at depth and then move upwards and almost all of the earthquakes we have seen lately are very shallow. I will now try to explain what is most likely to be happening in Katla that is causing these larger than normal earthquakes and what effect they may have upon the risk for an eruption in the near human future. The previous intrusions have emplaced magma in a shallow magma reservoir with an estimated top at 3 kilometres’ depth. Since the hot magma is buoyant it is exerting pressure on the lid as it tries to move up and that is causing fractures to happen. These fractures in turn can conduct fluids, be they tendrils of magma moving up, or meltwater from the glacier on top moving down. So far, the tendrils of magma have been too small for an eruption to occur and they have been rapidly cooled down corking up the fractures. They have though created an abundance of hot areas and they are heating up the water so much that they flash into superheated dry steam, and that flash turning also creates fracturing that magma or water can move into. In a way, this process of magma/water interaction has turned into a large engine that is slowly mulching up the roof of the magma chamber. At some point the lid will be too cracked up to be able to contain the pressure and when that happen things will likely happen rather quickly. In this case, it could take anything between a few hours to a couple of weeks from the point of when we get a continuous earthquake swarm to onset of eruption. So, if you see a powerful earthquake swarm start that goes on for a few hours and then just goes on and on, then it is time to expect an eruption. Right now, the volcano is teetering on the brink of what pressure the roof above the magma chamber can hold, and it will most likely break in the next couple of years unless things calm down considerably. One thing is though clear, the volcano is beyond being able to withstand another magma intrusion from depth, both volume wise and energy wise. And the fresh magma would be hotter than the magma in the magma chamber, so it would not only expand the chamber, it would also cause the pre-existing magma to heat up and inflate. If that happens we would have about 2 days to 2 weeks before an eruption occurs. Katla photographed by Dagur Bragason. To return to what Páll Einarsson said in the article. It is the job of Icelandic volcanoes to get ready for an eruption and then they do erupt when they are ready. So, in a sense of it, nearing an eruption is something that they always do. The trick is to correctly estimate and predict when they will do so. At the current level of understanding volcanoes, we can make long-term forecasts for volcanoes based on percentages of eruption risk for up to a decade in advance, but we can only accurately predict an upcoming eruption between 1 year in advance to 1 hour in advance depending on the volcano at hand. If we make a forecast we see that all 4 volcanoes are likely to erupt within the next decade, but that does not come as a surprise. If we instead try to predict these volcanoes the picture become slightly different since the short timespan for which we can accurately predict volcanoes. Currently we see that a prediction for Bárdarbunga and Grímsvötn are negative. We do know that they will not erupt in the timeframe we can predict them. We can also see that they are likely to not erupt in 2017 unless something rapidly changes, and if that happens the prediction would by necessity change. Hekla ends up hanging in the country between a forecast and a prediction. We do see forecast signs that it is nearing an eruption, but the extremely short time it is possible to predict an eruption at that particular volcano means that we can only accurately predict it minutes to hours prior to onset of eruption. Remember that all Hekla will give away is a small smattering of earthquakes and then the gates of hell open up (ice cream sold at convenient locations). Katla is further along towards the prediction stage when we can say when it will erupt and where. We are fairly certain that it will be a central caldera eruption, we can be fairly certain that it will be a VEI-4 or VEI-5 eruption, and we can be fairly certain that magma buoyancy and lid fracturing will be enough to break through within the next two years and if that does not happen one of the frequently occurring intrusions will be around the corner and that will assuredly take care of business. Unless something changes drastically Katla will erupt within the next couple of years at the going rate of seismic activity. Do we know when the other times where? I know we shouldn’t put too much trust into patterns etc, but still could be interesting to know if there was one, and as such potentially guestimate when the next one will happen. 1999. Curiously at that time, an intrusion also occurred at Eyjafjallajokull, and it was since then that Eyja became more seismically active. So, aprox 10 years between each, that would put the next in 2020/21. That is if there’s a pattern/rhythm to those intrusions. Which falls within the predicted possible timeline for an eruption. Grain of salt and all that. Katla had deep intrusion also in 2013,14 and 15. So its not a 10 year cycle, bit is getting more frequent, tho there were a few months since last deep swarm. So, if we apply the logic I attempted above, when should we expect the next one? Probably a few months, and if what carl said about the lid not being able to withstand much more, could that next intrusion be the one to tip the scales? What I mean to speak was that Katla had powerful intrusion events (with glacial floods reports and possibly tiny subglacial eruptions) in 1955, 1999 and 2011. Eyjafjallajokull has significant unrest in 1999 and 2009, erupting then a few months later in 2010. Katla is more likely that is receiving magma at a constant slow rate. Inflation has been going on for the past several years. We can´t know for sure when next eruption occurs. What I know is that this is the longest historical repose for Katla, and being that we are in a hotspot peak, I find it quite unlikely that Katla will continue without erupting within the next two decades. From what I gather from historical records Katla seems to behave in this fashion. Having periods of repose around 30-100 years, during which small restless periods occur with sudden glacial floods. In the past, locals were very afraid of crossing the sandurs plains south of Katla (usually on horse) due to the unpredictable nature of such floods. 1- KATLA. Likely to erupt within 10 years. Together with Grimsvotn I think both are the most likely volcanoes to erupt next. But like Carl said, most activity is shallow, so I look for a good sized deep intrusion before an eruption. Either that or the volcano will become severely unstable with so many shallow intrusions. I dont think Katla can´t hold more than 20 years, so I expect an eruption within the next years of decade or so. Either way, I expect a VEI5 eruption from it. And I predict that traffic in Volcanocafe would reach record levels by then. 2- GRIMSVOTN. Likely to erupt within 10 years. It got a large pool of fresh hotspot magma, so I see a significant reason that it will erupt again in the next few years (usualla Grimsvotn erupts every 5-10 years when very active, so that gives us a likely eruption until 2021). Such an eruption would probably be explosive but small. 3- BARDARBUNGA, I dont expect any large eruption from it, but I think minor VEI2 eruptions are quite likely and expectable in the few next years. Bardarbunga can at times erupt every few years, just like Grimsvotn, so why not? I still expect G and B to be the most active volcanoes in the next 30 years, erupting frequently. 4- THORDARHYRNA Of more interest is the region southwest of Grimsvotn, Háabunga or Thordarhyma. I attached an eruption record from 120 years ago, that shows Thordarhyrna erupting years after a large Grimsvotn eruption. I think Thordarhyrna could erupt in a decade or two. 5- ASKJA. This is an active volcano and there have been frequent intrusions to the northeast of the volcano. I think if Askja caldera receives a major influx of magma, and this is likely, considering the hotspot peak, then such magma will add to the pressure towards the northeast and could cause a minor fissure eruption there. Deep intrusions occur regular NE of Askja. 6- ORAEFAJOKULL. This has just awakened. I think this volcano will increase in seismic activity and might erupt within a few decades. But we will have years of observing more and more swarms until then. I dont expect anything within 10 years however. 7- HEKLA. I think Hekla changed behavior after the 2000/2008 SISZ earthquakes, so I think it will not erupt in soon. I think Hekla returned back to its 50-year-ish cycle and will postpone an eruption until mid century. Albert provided a really nice link to the paper behind the Sea of Marmara quake prediction. Using just the years listed on the papers graphics, I come up with a return interval of 4.87 to 14.45 years at the 90% confidence level. The last noted quake was 1999, and the window puts us past that year. But if you calc for 99% conf, sometime by 2016 comes up. Best bet? Anytime now, based on the stats. But on at least two documented occasions, the return interval was beyond 25 years. Caveat: I’m not a stats guy, or a geologist. My musings carry no weight. I am however, fascinated by Black Swans. This is not Swan territory, unless no one is paying attention and dismisses it all as total B/S that will never happen. Eventually, it WILL happen. But like Volcanoes, earthquakes don’t follow schedules. 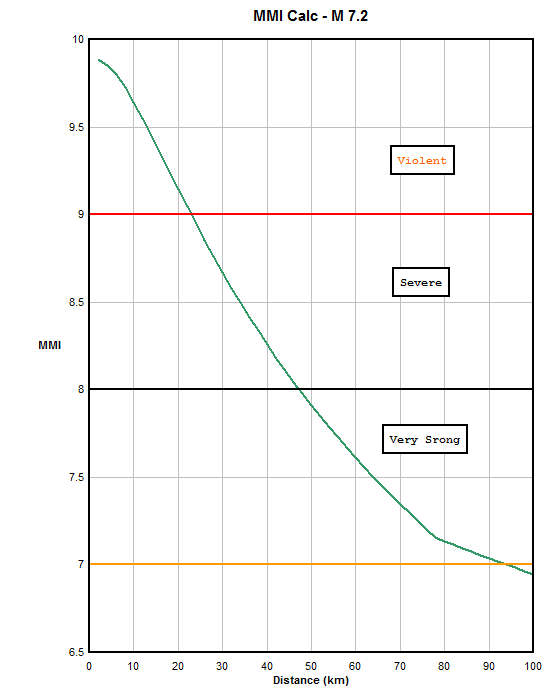 Proof of point: According to my numbers, they should already be in a recovery/disaster management phase. This one is gonna be interesting. The Sea of Marmara essentially makes up a tub of water. Even though it’s most likely gonna be strike-slip, when you shove two sides of a huge tub of water together, you’re gonna get a tsunami. It will be localized in focus and destruction, but it ain’t gonna be pretty. My advice? Don’t be there when it goes. It’s the only sure way to survive it. Bulletin of the Seismological Society of America, Vol. 84, No. 4, pp. 974-1002, August 1994, for a generic Mag 7.2 Strike-Slip quake. A real black swan would be a Laki-type event between Myrdalsjokul and Vatnajokull. No idea of the probability for it, but with eq activity both at Katla, Grimsvotn, Bardabunga et al, not impossible. I’m not even gonna hazard a guess…. but with a few of the Central Volcano Players still having a store of magma, and Holuhraun having been a play between Bardarbunga and the relief of tensile stress along the rift, I can’t rule it out. I’m also NOT saying it’s gonna happen, the Dead Zone region has about 4.194 meters of extension that hasn’t’ been relieved since 1783. Okay. I stand corrected. 4.186875 m is no further off than my initial 4.5 meter quip. Another factor in the equation is that many of the eqs in the run up the Holuhraun and during the eruption were large tectonic ones, not solely volcanic ones. Not that that makes prediction any easier. Well, what I can say, from reading the historical accounts about the quakes leading up to the 1783 event as felt in distal villages, then working back to the needed size quake at Lakiskagar to make those effects, there were likely a series of Mag 5.0 or so as the rift opened. From Wells-Coppersmith, that equates to an average of about .05 meters at a time… assuming Normal mode faulting. Please could you gives us the refeference of the Einarsson’s statement. Pictures of the destruction from the 6.5 earthquake island of Mindanao in the Philippines. A look from bottom-up at all M0.5+ EQs since 2004-present, in northern Vatnajokull. The three main areas of deep intrusions were/are Bardarbunga caldera+Kistufell area (prior to the eruption, and some deep quakes re-emerging below Bardarbunga again), and the third one is “Unknownabunga”, an area of vertical stacking of earthquakes SE of Bardarbunga, which could be a hidden subglacial volcano/volcanic feature (Intrusion activity before and after the eruption, but not during the eruption). Video will follow shortly till the evening. Thanks, I enjoy your plots very much!! And here is the promised video, with a more in-depth (pun intended) overview of seismic activity in northern Vatnajokull. Thanks again, can imaging it takes time but the results are realy interesting. Yor shows help also amateurs like me to build mental models of what is going on. Incredible video of the new lava hose in Hawaii. At least they used a drone. This is what they are for. An expendable camera in case something goes wrong. The drone is fine. It is the boat I find worrying. While it is worrying with the boat, I find the boat to be great at giving a sense of scale. – and a sense of danger. Presumably the drone came from one of the boats. But if there is another collapse, the boats would be in a tricky situation. is there a volcano in this location: Geirfuglasker 3.2 – 3.1 – 3.1? it’s more or less on the mid atlantic ridge. Even if there isn’t a named volcano (there probably is), the entire area is volcanic. But these quakes could very well be tectonic in origin. Even if they are tectonic however, that could lead to volcanic activity. The two do go hand-in-hand in Iceland. Geirfuglasker is a known volcano. It is intensely seismic from time to time. That’s turned into a fairly good deep swarm at Geirfuglasker. Down around 10-15 km. Wicki Peekin at Ya has this to saw about the dam. DWR(Department of Water Resources) in particular.. Tried to e-mail friends in Oroville- they have, apparently bugged out. I do not blame them..
Ororville that the spillway was a problem back 12 or 13 years…. Oh yes you do. Other things were more important to them. New items can get the responsible party’s name affixed to it, repaired stuff is just known by the name under which it was build or whatever name is plastered on it. Safety has nothing to do with it. Occasionally, when laying awake at night pondering inane stuff… I have to wonder just how far along we are over the ancient pharaohs of Egypt. Our rulers still run around trying to get new stuff made with their name on it. Under the ancient Egypt idea, it was so that your name would be remembered and spoken so that you could be immortal. What the motive is for the modern political wingnuts is the true question. Now, for California… they have a diminishing window of opportunity to keep this from getting really bad. Maybe Jerry can call in for some help from his UFO buddies. Last I read, they were leaving the damaged spillway in operation at a pretty high glow rate to slow the erosion rate on the emergency spillway (which has no reinforcement at all). If they loose the top 30 feet of the emergency spillway, they “could loose the I 70 corridor”. The damage in the main spillway which is in most press photos seems less of a problem than that in the emergency overflow (which I guess people thought would never be used so it wasn’t as urgent to maintain. ). It seems to have held – the reports of ‘failure in 60 minutes’ were useful more as a warning than as a prediction. From here on it may become a financial decision. The more they use the spillway to reduce the levels in the lake, the bigger the sinkhole will become and the more expensive it becomes to repair. Nice video in this report, seems the threat has passed now. My neighbor dawn Sumner tweeted this, she thinks they are dropping the rocks in the wrong place. She is a Davis professor who designed the EDL package for Mars Curiosity. A lot of her fieldwork is in the arctic studying sedimentation under glacial lakes. Not sure if I am using the right markups or how others include images here. Which makes me wonder, are any such lakes fed from volcanic mountains? 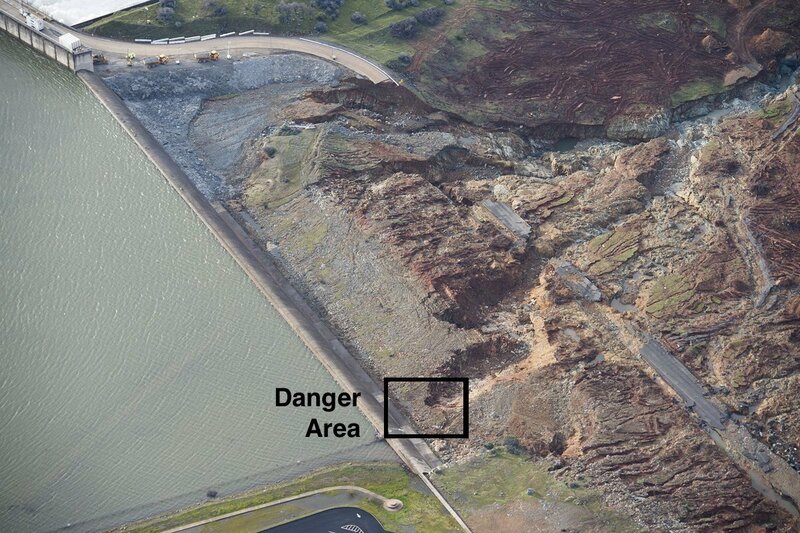 A debris flow getting into such a lake could seriously impact the containing dam. There is at Mount Baker. They were really worried about that dam during the eruption scare in 1975. There’s also one just south of St. Helens which was slightly affected by the 1980 eruption. I’m sure there’s a lot more than that around. Yep the Sandy river drainage and Bull Run Reservoir of the Portland Or. water supply comes to mind..
You could a similar landslip if the water level in the lake is reduced too far. The water provides some support for the surrounding land which can move without that support. From memory there was a very big disaster from someone over-draining a lake causing a landslip and mini tsunami that took out the dam. Just been on the news on BBC UK about the Dam Spillway there was no mention that the threat has passed in fact looked like they were evacuating more towns . They are freaking out since another storm is forecast to dump more drought on the watershed of the feather river. 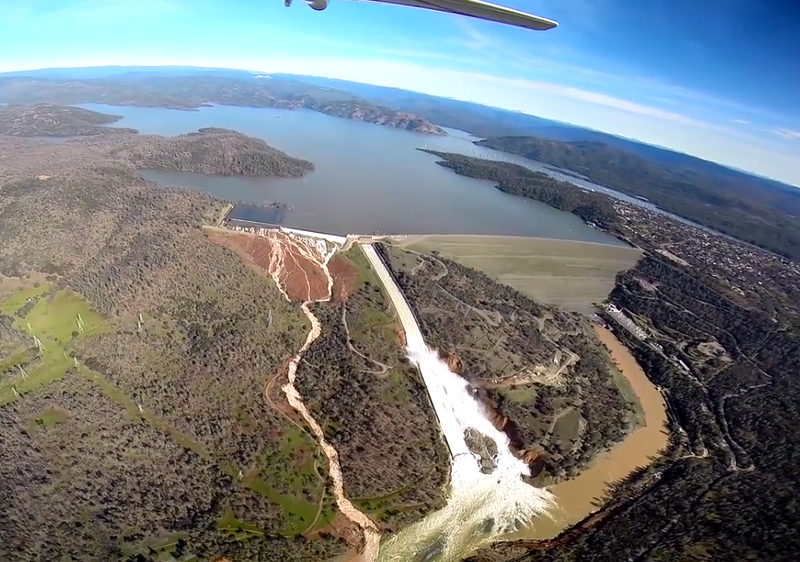 Pretty good profile shot in that link showing just how far back the main spillway race has been undercut. It’s a Reuters image so I won’t link it. But if it expires give me a shout, I have an archived copy of it. But, it is the California Government doing government things. Would you trust them? They had ample opportunity to make repairs back during their “permanent” drought. Anecdotal, but I’ve heard mentioned that California typically has 500 year droughts punctuated by massive flooding. The last 100 or so years has been atypically moist, allowing a significant agricultural industry to develop. Then they crammed millions of people into a normally semi-arid environment. 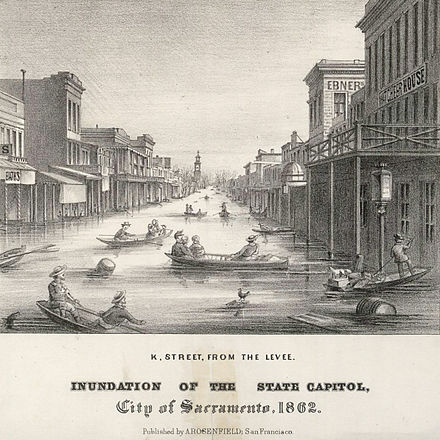 I do know that at one time back in the 1800’s, the whole of the Sacramento valley turned into a large shallow lake. I remember during the 1970s when I visited my dad in Sacramento there was worry about a crack in the Oroville dam then after an EQ. We were waiting to hear whether to leave or not. Thankfully we didn’t have too. My prayers go out to all those people. Photos of the flooded areas of Oroville. But this should be taken with some caution. The two droughts coincided with the period of warm climate in Europe, so it is natural to assume that the warmer climate of the next decades will bring dryer weather. But the climate dynamics are very different now because so much heat is taken up by the oceans and the warming in the arctic is so extreme. It is not so easy to predict what will happen, and it is unlikely to be a carbon copy of the past. My guess would be that the ground will dry out further, as evaporation exceeds rain plus run-off, but that when it rains it will be more intense. Judging risks by ‘1 in 100 year floods’ has become meaningless. The next 100 year are nothing like the last one, and what happened once a century in the past may be once every few years in the future. It is the ‘1 in 1000 year’ floods you need to be prepared for. And finally a first sequential earthquake animation for Katla caldera, spanning from 2011 till 2017 (February). And while watching making it, even I was surprised how well the deep intrusions of magma are seen, and it looks like it has reached at least into the mid system (10-18km) and now has an almost open or semi-open deep system, which is why I am speculating that we do not see as much deeper quakes in that main feeder anymore, but are focused rather around 20km or less, in the mid system. Some earthquakes are seen as nice vertical stacks, which really gives you the idea of a crack forming. This is mostly evident in the mid and deeper levels with dike intrusions. Given the amount of EQs in its deep system in the last 6 years, and considering that magma was probably going there and probably heated and melted the canals to some extent, I am not surprised to see less EQs at that deepest levels anymore. It does seem that magma has found its paths into the mid system, and if I speculate, I would say that if by now, it does have a sustained path or a semi-open deep system, it could “over-flow” or re-heat the 8km-15km magma body under Katla, which was probably doing for quite a while before, since the last eruption for almost 100 years, but we just have seismic data for only last 15-20 years. So more important right now, might be to look for earthquakes between 10-15km depth, down to perhaps 18km. But in this mid system. 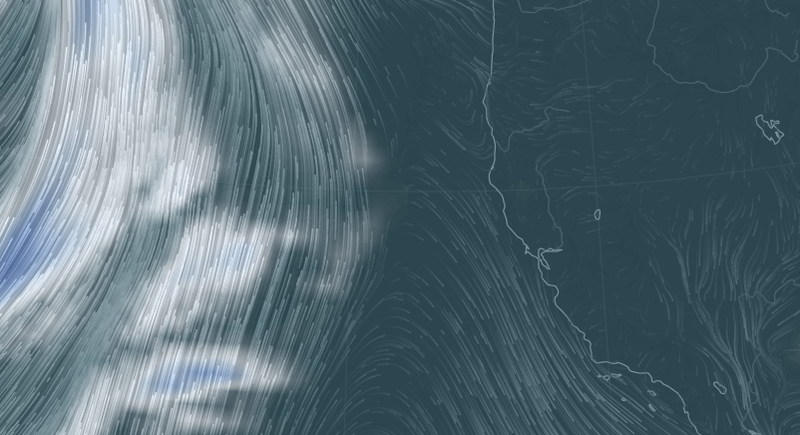 The deeper system I think is primed already and now the next stage is already occuring in the mid system. There might still be deeper quakes with new intrusions, perhaps stronger ones even, that would cause more strain on the “canals” and cause seismic signals. Nonetheless, the latest intrusions are not old, but new, and given all this data, Katla is still equally likely to erupt than before. This data and visualisations just gives a new perspective on its underground systems, and now I finally see where its mid-deep magma body might be, at the same depths that were indicated by tomography models and theorised about. It is more elliptical in shape, and not uniform in size/shape. It is seen in the past 6 years of data as a bowl or “tummy” growing out of the Katla mid-system towards S/SE. This could either be the expanding body or something else. There is no GPS data confirming this to a large extent, but it is quite at depth (15km) and it could be moving out by cracking and melting the “outer walls”, which does seem supported by the seismic data, and would explain the lack of any real GPS signal in that area, not to mention the distance to nearby GPS stations. And it is (expanding or whatever it is doing) under the S/SE part of the Caldera, most evident at around 12-16km depth, where there are no stations above ground, expect for SOHO and HVOL. This is just my thinking and the data is open for interpretation. And here is an image comparing older activity with recent. It is obvious that with the emergence of the deeper activity and dike intrusions, there was a shift in the Katla mid-system. It is also noteworthy in the image above that there were not so many (or at all) vertical stacks of earthquakes in the caldera itself at the shallow depths (down to ~3-4km), compared to recent years where the stacking is obvious, and is quite likely associated with the hydrothermal activity and water which goes into cracks of the caldera floor, where it is heated by underlying magma and which can cause phreato-magmatic explosions and causing more earthquakes and more cracks in the lid. Almost like the volcano is “fracking” itself out. Its amazing and almost scary how calm the seismometers are in Iceland at the moment. Everything at background levels. Not even wind noise is to be seen. Just wait for spring.. Stochasism will bite back. I’m still wondering about the rapidly shifting magma as explanation for the larger Bárðarbunga quakes. It just doesn’t feel intuitive. In light of the earthquake sequence during the eruption, where the larger quakes were clearly linked to the subsiding plug, it seems likely that the sequence up to 1996, as well as the current sequence, can be explained by opposite movement on large sections of the ring fault. This is not contradicted by the lack of a volumetric component. A GPS on the caldera would be interesting. You could have magma migrating up, with inflation above but deflation further out, with no net volume change. Or magma going down, with the opposite pattern. All we know is that the motion is different from that during the eruption, when there was a net loss of volume. More than one mechanism could fit the bill. I think. The thing is, that even during the eruption, when volume was clearly lost, the moment tensor solutions for the bigger quakes (as listed in the Global CMT) don’t have a volumetric component. A planar fault (pure double-couple) does not have a volumetric component, so a superposition of planar faults that make up a section of a conical fault won’t have a volumetric component either. Expanding or closing cracks would have a volumetric component. Bottom line, I think the term “no net volumetric change” is interpreted too literally in this case. Can someone give the “For Dummies” version of this please. I’m sure it’s interesting, but is way over my head. Maybe not the for dummies version, but at least some reading (ie highly technical stuff) about non-DC mechanisms. I haven’t read it, but I did read quite a bit about the non-DC event preceeding the fissure eruption between bardabunga and grimsvotn. In a usual quake, the “first motion” of a quakes waveform tell you if the initial displacement was extentional or tensile in the direction of the seismic station making the recording. Look at and plot enough of these stations, and you can get a good idea of the style of faulting that made the quake. Strike-slip, Normal, or Reverse faulting. This solution is referred to as the couplet of the quake. We usually see the results as a beach ball plot. What a non-DC quake is, is one that does not show a bet displacement in its focal mechanism. Flat out explosions show a compressive wave in all quadrants. (I’ve tried this with fireworks and an accelerometer). The only events that show non-DC waveforms are those where nothing really changed. Such as one pocket of magma changing places with another mass of rock above or below it… showing no distinct displacement of the crust along any of the cardinal points. Side note. I’ve also recorded masses hitting the ground with my accelerometer. Every time… negative first motions as the ground initially pulls away from the sensor. If you combine two or more pure DC events you can get (but not always) a resulting non-DC signature. That surely has to mean there is a net displacement even if the mechanism isn’t pure DC. The magma shifting hypothesis also requires more than one point source, namely one implosive and one explosive, separated by a few km in depth. The main problem with moment tensor analysis is that it models a point source, while the actual event has a more complicated geometry. In the eruption sequence, several of the M5+ quakes could be directly linked to subsidence up to 30cm per quake. Yet, the recorded mechanisms were non-DC. I am not sure how many of the earthquakes during the eruption were of this type. We did see GPS drops after the strongest quakes. Here is a list of all larger quakes, both pre eruptive and during the eruption. Note that beach balls during the eruption are inverted versions of the pre eruptive sequence. It is also possible to get eigenvalues of the moment tensor solutions if you go back to the search page and select the full format output. Decomposing the moment tensors into DC and CLVD parts, show that the quakes associated with subsidence do have a very strong CLVD component. This is not my area of expertise, so if anyone has a good explanation why a highly non-DC quake without volumetric component can be linked to subsidence, I’d be very interested. My guess is shear faulting with a complex geometry. New post! Looking into hell’s mouth.